Certainly “grown ups” can’t be responsible for this. The past two weeks we have seen an elevated amount of vandalism at Pleasure House Point. 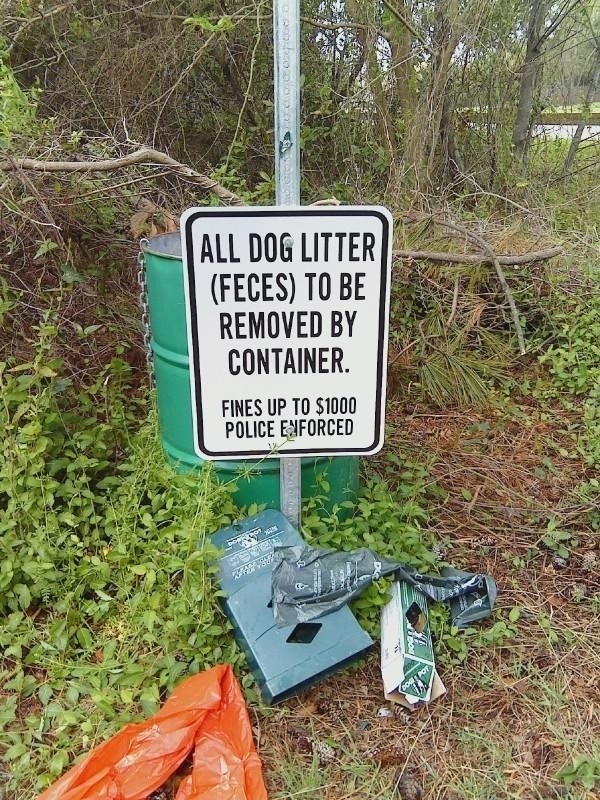 The two dog boxes were ripped from their signs, along the two Marlin Bay trails, last week. We installed new ones and I inspected the site yesterday and found that the same occurred again. Last week we found that a household kitchen bag was dumped on a trail. Mail within the bag was addressed to (redacted). Yesterday, along the same trail I found four very large bags dumped on the trail. I removed the litter and pulled the dog boxes out of the woods from where they were thrown and placed them beside the posts from which they were installed. At this point we are discussing which dog boxes to reinstall. A police report was given and I have a case number pertaining to the issue. I wanted to keep you posted as well as possibly ask if you wouldn’t mind mentioning something about this in your next OPCL Newsletter. Please let me know if you need other information or anything on our end. I appreciate your assistance in this matter. Photo taken at April 20th clean up on PHP. This entry was posted in Communications, Current Concerns, Environment, Neighborhood Watch, News, Quality of Life, Safety. Bookmark the permalink. ← Ocean Park to get sand now. Chic’s Beach in a few years.